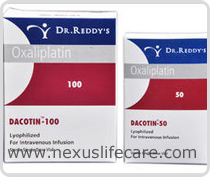 Uses:- Oxaliplatin Injection used mainly for the treatment of breast, ovarian and non-small cell lung cancer. It has an approved claim for treatment of patients, who have locally advanced or metastatic breast or non small-cell lung cancer. Side Effects:- atigue, fever, pain, headache, insomnia, nausea, diarrhoea, vomiting, abdominal pain, constipation, anorexia, stomatitis, anaemia, thrombocytopenia, leukopenia, back pain, dyspnoea, peripheral oedema, thromboembolism, dizziness, rash, alopecia, hand-foot syndrome, arthralgia, rhinitis.